With the end of the year being on the threshold, it’s time to start summing everything up. For the Asian company going by the name of High Tech Computer (HTC) the year of 2006 has brought some benefits – the company has been into re-branding, extending its range and moving straight into 3G. 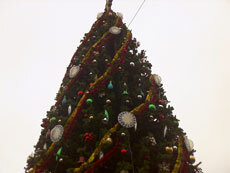 In 2005 three models saw release, leaving out the canceled project known as “Blizzard”. 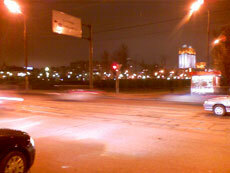 Here and onwards we are not counting smartphones, CDMA-solutions and minor updates to the basic models. Though in 2006 the market has already seen five all-round new Pocket PCs coming from HTC, at that one model hasn’t made it to the shelves eventually – a multimedia communicator HTC Muse. 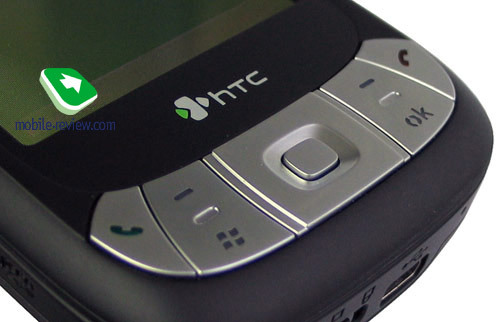 Early in 2006 HTC Prophet (Qtek S200) was launched – the last communicator the company released before getting to have an own HTC brand. 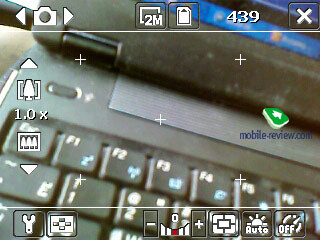 The same platform is made use of by a navigation communicator HTC P3300 (Artemis) and a QWERTY-slider HTC P4350 (Herald). The latter offering is actually being stared upon in this review. 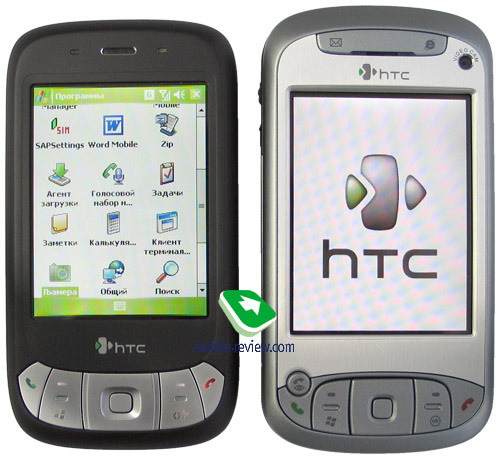 And finally, the company has come up with a pair of 3G-enabled models: HTC TyTN (Hermes) and HTC P3600 (Trinity). So, we have five products in sum, running on only two stand-alone platforms. In fact, over at HTC, they started to consider getting into QWERTY-powered devices only last year – the hype around BlackBerry and mobile mailing coming to the frontlines, were the reasons. 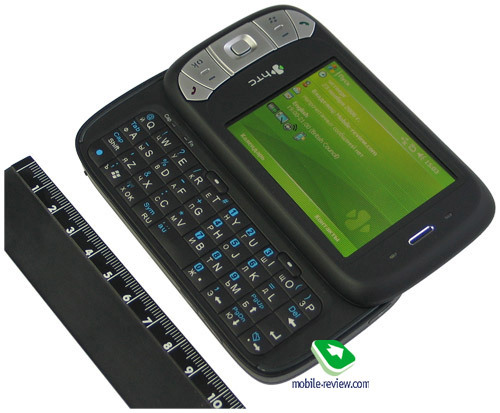 Initially, the concept of providing users with QWERTY-keyboard experience came down to a candy-bar shaped casing with the keyboard block placed under the display (similarly to Palm Treo, and BlackBerry-branded solutions). 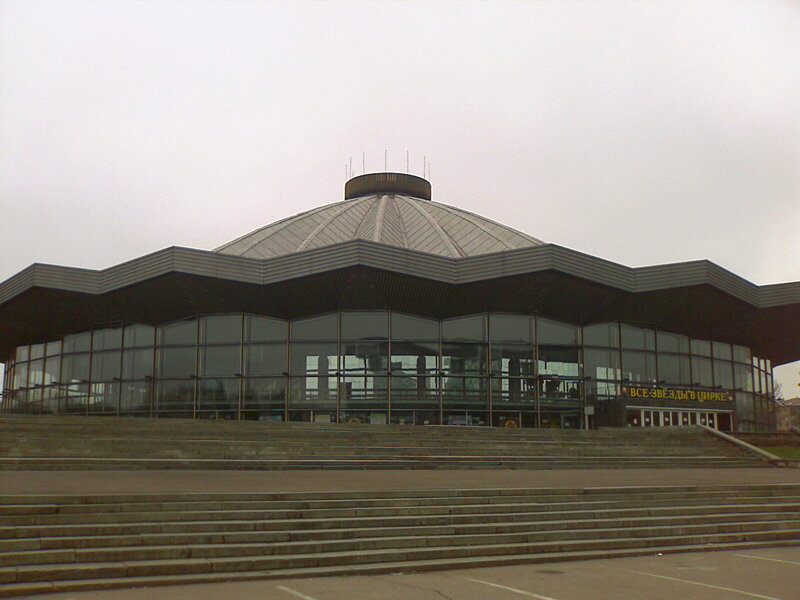 However this was the field that allowed for so much new concepts made up by designers – just think about it, what designs, form-factors and shapes we haven’t see yet? 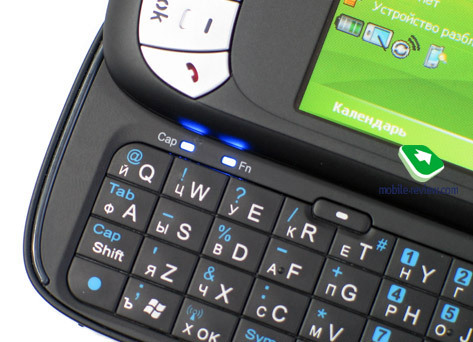 Remember the terminated project of Motorola MPx, Nokia’s very own communicators coming from the 9000-series, Sony Ericsson M600 (which cannot be attributed to QWERTY-solutions in the full sense of this word). And up until now merging a thumbboard with a mobile device has been the limelight for developers – I guess more unique and originals products are coming up, no doubt about that. 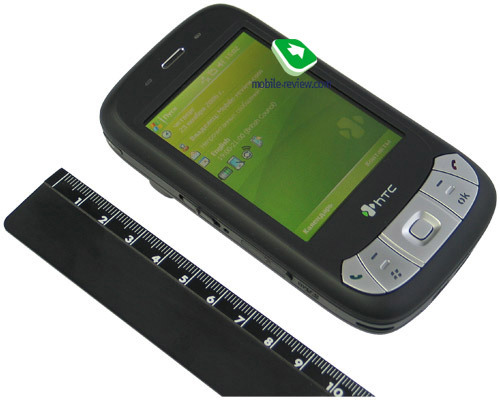 After the release of HTC Magician (Qtek S100/S110) all other makers specializing in Windows Mobile-communicators followed in the footsteps of HTC and delivered relatively portable Pocket PC armed with 2.8” display. Fast-forward a year since the launch of HTC Wizard (Qtek 9100) equipped with a side-mounted keyboard and see that the company’s rivals are replicating the concept put into the Wizard. That is how come HTC is an undeniable trendsetter at least in these two fields. As a matter of fact, such layout is the best thing they could possible do – when you feel no need in it, you can just hide it, at that landscape orientation allows implementing a bigger and thus handier keyboard block. 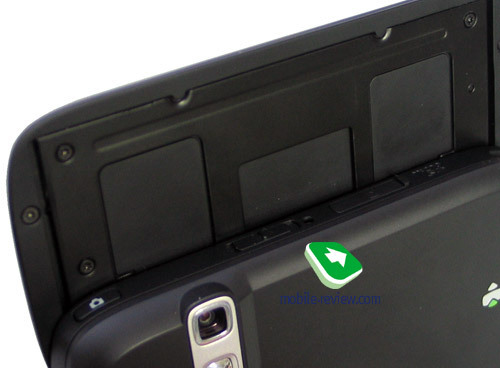 Nevertheless the very idea of slide-out thumbboard was brought about not by HTC in the first place – such solution had been around for quite a while by then with Bsquare Power Handheld, LG F9100, and a tablet computer by OQO. 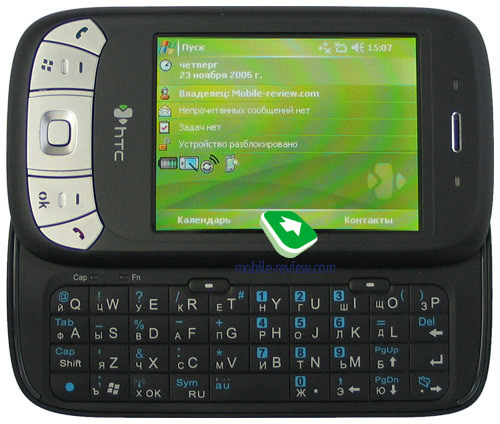 After coming up with HTC Wizard, in order to provide fresh forces for its range, in 2006 the company has been releasing modifications of the basic model running on Texas Instruments OMAP 850: HTC Prophet – keyboard-less edition of HTC Wizard; HTC Artemis – significantly revamped GPS-modification of the basic platform and finally HTC Herald, which is being reviewed today. Though HTC is by no means going to stop at this point – the next year will see an entry-level Pocket PC with the most simplified platform possible and missing Wi-Fi. microSD memory card slot instead of miniSD. 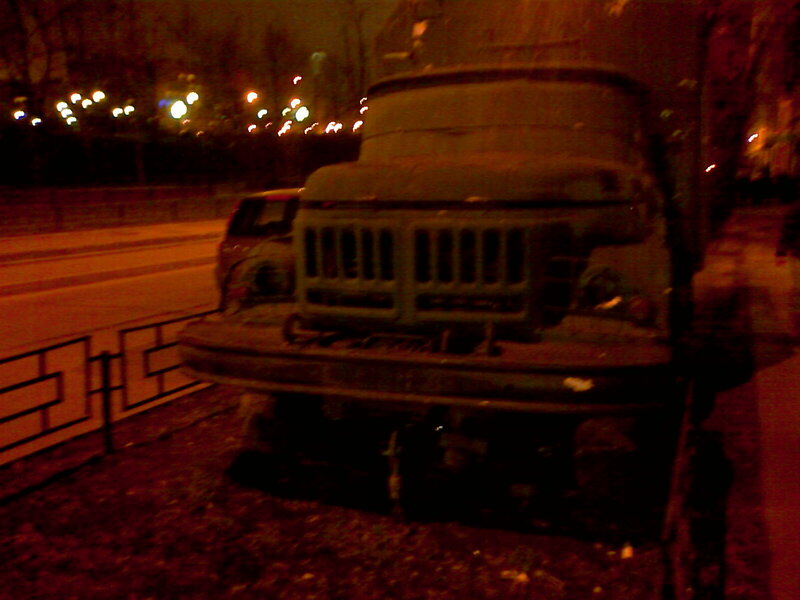 Lower capacity of the battery. 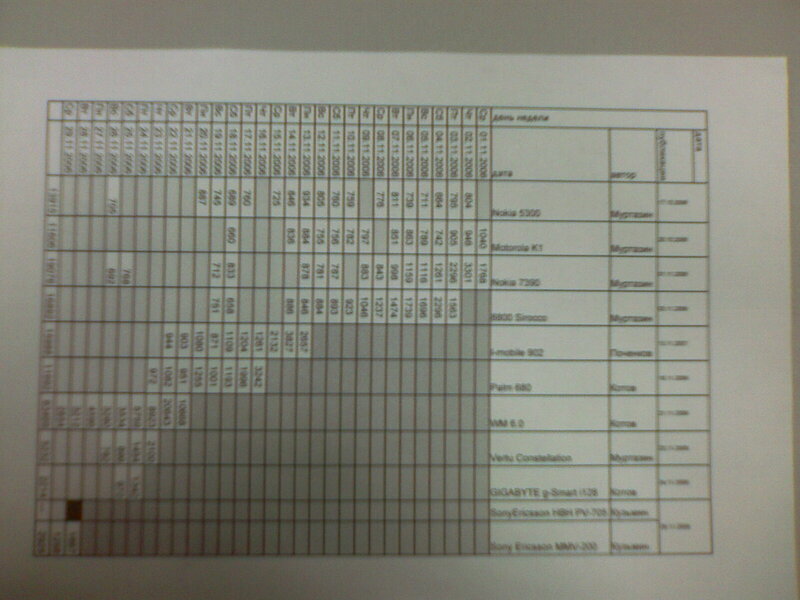 OS Windows Mobile 5.0 powered by AKU 3.2. 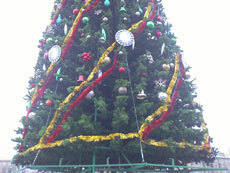 After brief hesitation, they picked black as the casing’s main color, even though early release candidates were taupe. The casing’s curves are now not so “barrel-like”, as they were on HTC Wizard; this Herald is somewhat similar to HTC Prophet dimensions-wise, so it’s not a big deal to confuse them from afar. Almost all owners of HTC Wizard that I know gave the P4350 positive marks for its looks owing to more portable and thus appealing casing, auto opening mechanism (read more below). And about a half of these people seriously considered the possibility of updating their old Wizards with the Herald. The faceplate of the communicator is made of black-coated matt metal, which offers pleasant tactile feelings (which is pretty much the same to that of Parker Insignia Matte Black pen). All other parts, except for the abovementioned front plate employ rough black plastic – undoubtedly, it could have utilized some metal as well, but in this case the P4350 would have weighted even more, and who needs a device heavy as a brick? Speaking about the weight, the Herald tipped our scales at 174 grams, whereas the official press-release features 168 grams. Assuming that our figure is the most objective one, it turns out that the P4350 is heavier than its predecessor, HTC Wizard (169 grams. ), and due to more compact dimensions, be sure – you will feel the difference. We even carried out a simple test – we asked a few people to tell which device feels heavier: HTC P4350 or TyTN (the latter product is in fact the heaviest of two, according to the scales). The answer was always the same: The P4350 weights more” – even though the facts are against this. So, it seems that people generally measure not the weight itself, but “density”, which is higher for the Herald. At a glance you won’t instantly figure out that the device in fact houses a slide-out thumbboard, because it’s so much similar to the keyboard-less HTC Prophet. Don’t even try looking for the exact dimensions of the P4350 – there aren’t stated anywhere, even in the User Guide. However our tests resulted in the following figures - 109.7x59.2x17.7~19.5 mm, which means that the official press-release gives you not the whole truth by insisting on the casing being only 17 mm deep – in fact, it’s thicker that its thinnest part by 0.7 mm. Of course, no death penalty is going to be inflicted, but the reason for such tricks is not evident, since 17 or 18 mm are so much slimmer than HTC Wizard’s 23.7 mm. 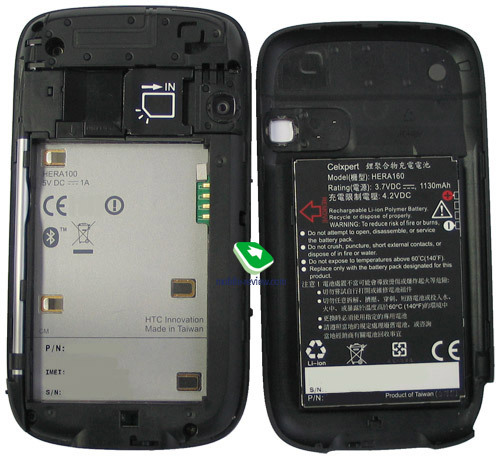 Perhaps, it is the very first time when we have a serious complaint about the build quality of HTC’s product – specifically, this regard the battery cover, occupying the entire rear of the P4350. The problem is that the cover rests on four points with only one located at the bottom, so if you hook it on with your nail somewhere close to the stylus’s slot, lifting the cover up by 5-6 mm is easy. Such solution can be barely called reliable – going for 5-point fastening would make more sense – at that, considerable horizontal gap of the back cover is evident, which is also a major flaw. Unlike HTC Wizard, the display is topped by nothing but a bald area. The designers have slightly altered only the block containing the function keys under the screen, which are now set close to each other and prove to be somewhat dirt-resistant. All controls required to manage Windows Mobile 5.0 without drawing the stylus are on place and include a handy four-way joystick with an implemented action-button, pick/hang up keys, soft buttons, “OK” and “Start” dedicated keys. By default all these buttons are locked, so that turning the P4350 on is possible only with the help of the power button. That’s why you shouldn’t express any concern upon accidental presses. The left side houses a camera shortcut button, volume control slider (using third-party utilities, for example AE Button Plusyou can assign up/down action to it), soft reset button and covered by a rubber flap microSD memory cards slot. The camera trigger is positioned in a way that you absentmindedly start opening the device when trying to take a shot (forefinger of your right hand lies on the dedicated button, while you hold the device side-ways). The Herald seamlessly handles all microSD cards that don’t exceed 2 Gb in size. On the right you will find two buttons that by default stand for calling up Comm Manager and Voice management activation. 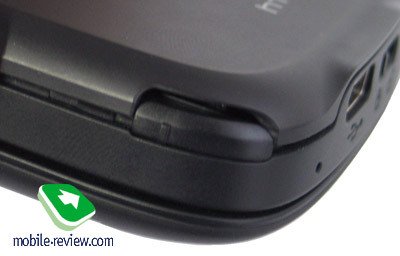 The stylus slot, microphone, holes for a carrying strap, battery cover latch and HTC Ext USB socket are mounted on the bottom rim. The Ext USB interface is used for plugging in a charger, data cable and headsets. Regrettably, you are unable to connect your lovely-favorite headphones and will have to deal with the earphones included in the package, which is a quite remarkable drawback, dramatically reducing the communicator’s prowess in the music department. 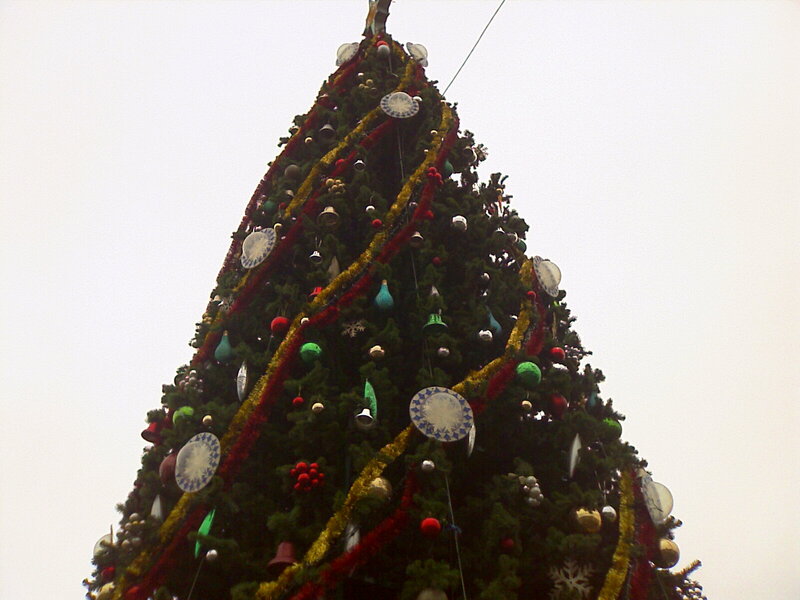 But, after all, it’s a communicator, so don’t be too hard on it in the sense of music playback. And as regards the stylus, it offers medium size, which is still bigger than that of HTC Wizard’s one and thus proves to be much more easier to work with. 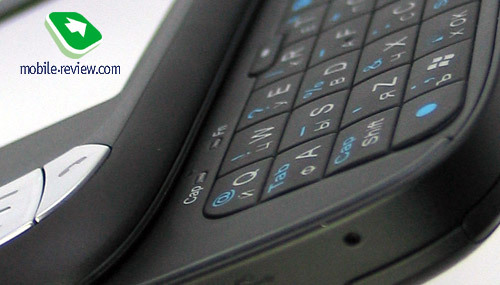 The top end features the power buttons – tapping and holding it for a while results in complete communicator shut down. The rear of the Pocket PC would be bald if there weren’t camera lens, a self-portrait mirror and an average loudspeaker (volume-wise), that doesn’t stand out too much, though. And finally, onto the bundled keyboard – as we said above, the slide-out design considerably increases the keyboard’s size and therefore boosts rockets its ease of use. Unlike the previous models, the keyboard block slides to the left, rather than to the right, which is the right thing, as it’s always better to slide the device open with your right hand’s thumb. And once you start the process, the auto opening mechanism does the rest of work for you, the same holds true when you close it. You can also bind up sliding open/close to one of three sounds or turn on silent mode. As for the buttons, they provide fairly good tactile feelings and solid feedback. The P4350 can be managed with the slid-out keyboard alone. All keys are lit in white-blue, which is well-visible both in the dark and sun. 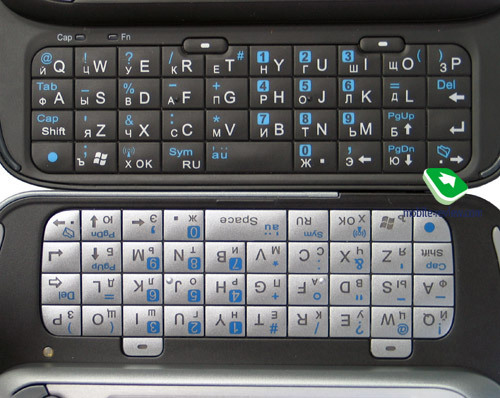 All units for the Russian market will come included with keyboards localized on the factories, switching between languages is done by pressing a dedicated key. On picking the Russian layout, the navigation keys get bound as well, but it isn’t much of a hassle, since nothing you from turning to the joystick on the device’s front. Some symbols found engraved on the keyboard can be entered only using the “Fn” button (blue dot in the lower left corner) – two light indicators for this button and dedicated “Cap” key are located on top of the keyboard, which will be greatly appreciated by thumbboard lovers. The model houses a 2 Mpix CMOS-powered camera module. 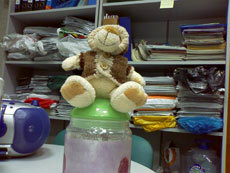 Unlike HTC Prophet (Qtek S200), here you won’t find macro-mode, as well as auto-focus and flash. Even though the snaps taken with the P4350 don’t break the ground, they appear to be quite good quality-wise. One of the most positive changes is enhanced color rendering, so that from now on bright areas on pictures don’t get filled with white only. In daylight, one can snap really nice-looking shots, but once you move to darker places or need to have a macro-shot, everything changes for worse. Contrast, Saturation, Hue, Sharpness, Contrast can be adjusted as well (by default these settings are on auto). 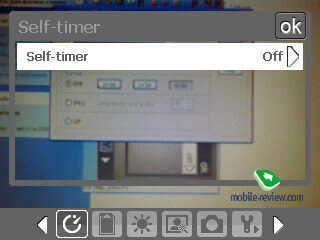 Other features include – self-timer, on-picture date and time, silent shutter and some more. Apart from photo and video modes, the camera offers a couple of others – video for MMS, snapshot for contact, “sport” and burst modes. A series of 5 images taken at miserable intervals – that is what “sport” mode is, in its turn Burst allows you to get 30 pictures at a time. Those having free time and a strong desire for experiments involving the camera, at their disposal, may try going for CoolCamera utility – using it you can boost maximum resolution for video and make the communicator double as a Web-camera for you desktop PC and Skype-related purposes. Speaking about the display, we will have to use a cliche again, for it is similar to most screens found on the majority of recently-released Windows Mobile-communicators. The matrix sporting a resolution of 320x240 pixels (QVGA) and capable of 65 K colors, measures 2.8” diagonally, which is almost an all-time (at least for now) standard for this type of devices, and I’m sick of writing this, honestly. The viewing angles are quite big – the colors actually do get inversed, but don’t make all the difference. Similarly to HTC Wizard there are four levels of backlighting available. The display’s behavior in the sun is OK – it fades but still allows for reading information without any problems. The dimmest level of backlighting fits managing the communicator in the dark best. 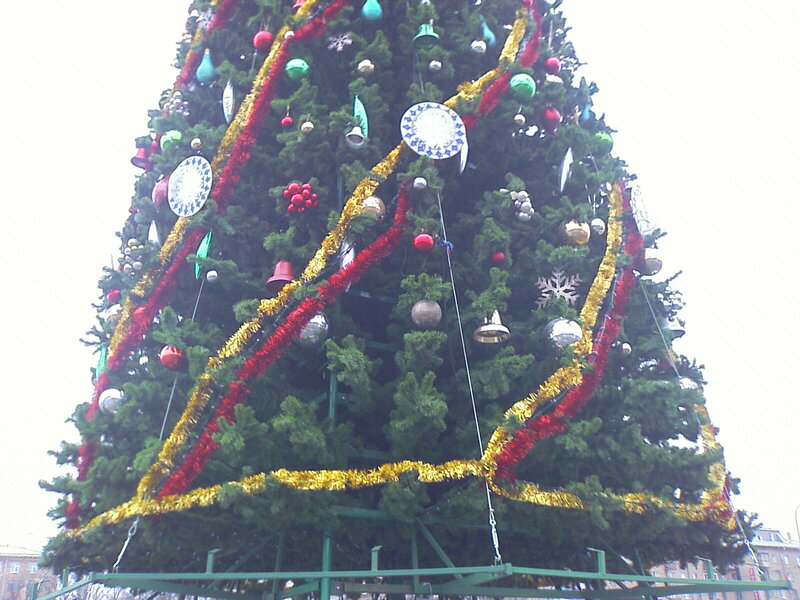 But overall, the display’s quality is slightly above average owing to splendid viewing angles. 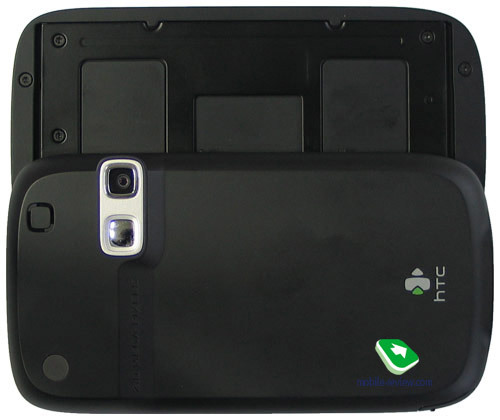 The removable 1130 mAh Li-Ion battery found on the P4350 is about 11% less capacious that HTC Wizard. 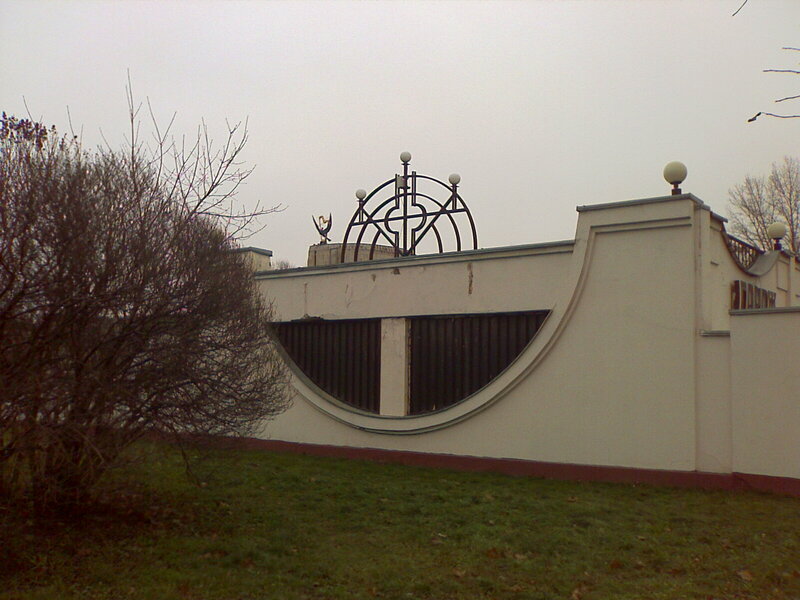 In the conditions of Moscow networks and being the main phone, the communicator lasted two days on average and occasionally had a hard time making it to the evening of the second day (about 35-40 minutes of calls a day, about 15 SMS-messages, 15-20 snaps, 1 hour of Web surfing via GPRS, 30 minutes of video playback via Wi-Fi). Should you be heavier on it (MP3 playback – 2-3 hours, active e-mail and Internet usage, Wi-Fi connectivity), the lifetime will decrease dramatically to a miserable day or even less. “Demanding” users should get ready to recharge their units every day. Although, you will squeeze about 3-4 days of stable operation, if you will spend only 5 minutes talking each day and forget about other functions of the Herald. We put the battery through its paces with the left of our standard tests in three modes – the communicator put up quite admirable performance as compared to its rivals (taking into account less capable battery). 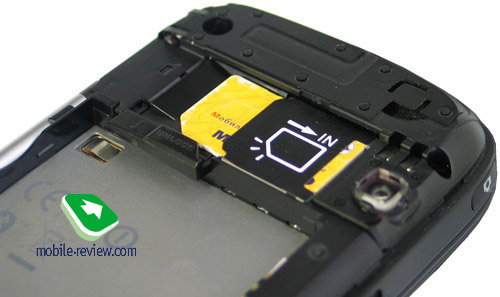 The SIM-card’s bed is located not under the battery but next to it, nevertheless there is no way you will extract the SIM without detaching the battery – a latch must be unlocked at first. Nothing has changed much since HTC Artemis, so everything said back then holds true for the Herald as well. The model retains reasonably lengthy list of interfaces, which we are about to describe. 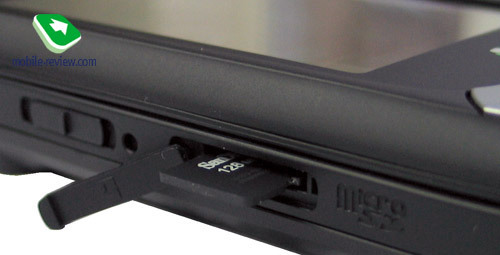 HTC ExtUSB connector acts as miniUSB-socket and a slot for the bundled headset (user is unable to plug in a headset of his/her own and limited to the one found in the package). At that it provides moderate sound quality with disputable design – not everyone will find this type of earphones appealing. ExtUSB connector significantly cuts down the communicator’s chances of performing on a par with a music player. 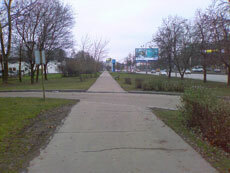 Though, the device’s day is partly saved by good stereo Bluetooth-headset. Naturally, this connector is compatible with standard chargers and USB cables of older models. Bluetooth 2.0 without EDR, but boasting considerably increased number of supported profiles. Bluetooth module is managed by standard Microsoft’s drivers. Let us see what BT here can do and for what purpose. We have tested all these profiles, saving for the last one (SAP) and are now confident to state that Bluetooth found in the P4350 deserves a very high mark – everything works fine. 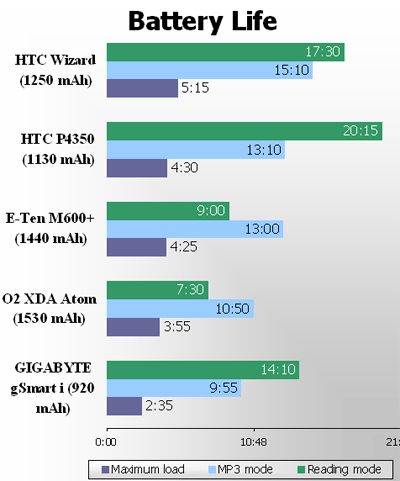 HTC P4350 is attributed to the second generation, which means 3G/UMTS support is missing here. The communicator handles four GSM bands and has EDGE class B, multi-slot class 10 onboard. Infrared is also absent in its spec sheet; however we are not going to consider it to be a crucial drawback. The communicator runs on Windows Mobile 5.0 powered by AKU 3.2 update pack. An in-depth review on Windows Mobile 5.0 can be found in a dedicated article on our portal, so that we are free to dwell on pre-installed applications instead. The communicator supports all methods of data input you can think of – the hardware QWERTY keyboard, virtual thumbboard and hand-written text recognition. However the Phone pad is missing – an additional way of input, which is an on-screen numeric keypad. Audio Manager 1.0. A new app by HTC aiming only at one thing – music playback, however it’s strange that such program has made it to HTC P435, as in the sense of capabilities, the Audio Manager is way inferior to the bundled Windows Media Mobile. Why would they need to reinvent the wheel? 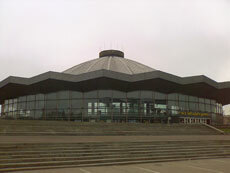 Voice Recorder 1.0. Another newcomer here for recording voice notes, though it has a little to offer, or even worse – it’s a dead app functionality-wise, since settings are non-existent here. 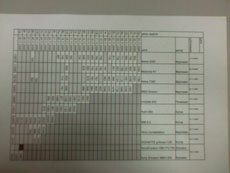 Task Manager 1.0. With the help of this utility, the cross button in Windows Mobile now terminates applications instead of minimizing – but that’s about it. Adobe Reader LE 2.0. As the application’s name says, it helps in viewing PDF-documents. Smart Dialing 2.5. This add-on for the Phone application enhances the Pocket PC with search function working in the contact list, available in Windows Mobile edition for smartphones. MMS. 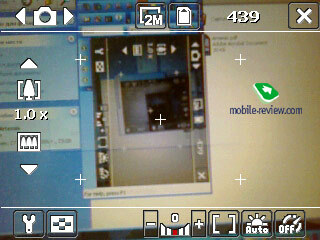 Since the operating system houses no bundled multimedia messages editor, manufacturer have to turn their sight to third-party applications – in the case with the P4350 it is MMS Composer written by ArcSoft (version 3.5.1.17). The interface layout used for MMS is visual, easy to use and get used to, thus you won’t experience any hardships with MMS. Voice Speed Dial. Making use of this app you can record voice tags for contacts (including those stored on the SIM-card) or applications, though prior training is required, as Voice Speed Dial is not a speaker-independent technology user. As we mentioned before, the casing houses a dedicated button allowing you to call up this application. Developer – Taiwanese company Cyberon. MIDlet Manager. As the app’s name implies, it serves for starting up Java-applications, and even though not all available to date Java-powered programs agree to run with the Herald, it’s not that much of a problem, really – especially when thinking of a fully functional operating system. 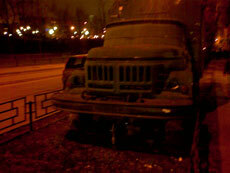 Support for Java 3D is missing, MIDP version – 2.0. Developer - Tao Group Ltd.
At the end of the day the Herald incorporates quite a bunch of useful applications onboard. All-round new programs developed by HTC (Audio Manager, Voice Recorder), regrettably, cannot make you stop smiling – we do hope that with time they are turning into a truly handy tool for many, but keeping this in mind you shouldn’t overlook the fact that there are thousands of third-party apps available on the Web for any communicator, so pick whatever you see fit. 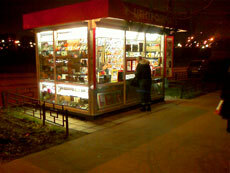 On the Russian market the device will come included with localization pack by Microsoft. The heart of the Herald is Texas Instruments OMAP 850 CPU whose frequency tops out at 200 MHz (inquisitive readers may find more details here). Depending on current load level, CPU’s frequency gets adjusted to the needs of the system automatically. Volume of RAM makes 64 Mb, where 44.01 Mb can be managed by user, plus flash-memory (intended for storing users’ data) – 42.55 Mb (out of 128 Mb). The RAM volume is quite enough for stable operation; by plugging in a microSD card, amount of bundled flash-memory becomes insignificant. Speaking about performance today is nearly equal twaddle – due to making use of the outdated platform, the Herald’s figures aren’t too much different from what we saw with HTC Wizard, HTC Prophet, HTC Artemis. The provided performance is just enough to handle the interface and bundled apps in a convenient fashion, whereas managing Skype and watching video clips without prior conversion might turn out to be troublesome. 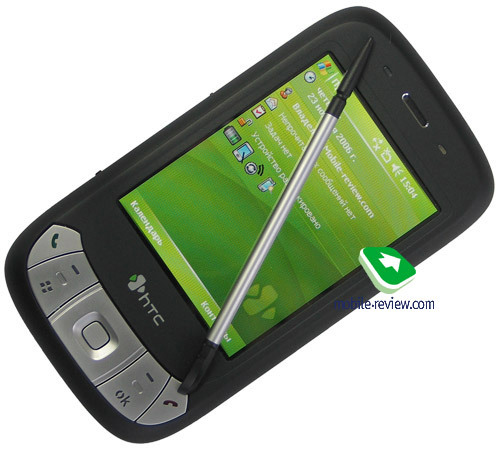 HTC P4350 is nothing special on the reception front – it does well, just as expected. The ringtones’ volume is average, so setting any MP3 or WMA track as a tune makes sense, but if you don’t want to miss a call in crowded and phone calls-unfriendly areas, better go for an unsophisticated warble, set as a ringtone. The communicator arrives in the market in December, 2006, although start of mass sales is schedule for the beginning of 2007, initially the P4350 will be retailed for 740-750 USD, but there is a good chance that in course of its lifecycle the price will drop down to 550-600 USD for a unit. All QWERTY-powered Pocket PC offerings by HTC, due out in the first six months of the upcoming year, may be divided into four main branches: models equipped with 2.8” displays form two branches, virtually pulled apart by support for 3G networks (2G-communicator HTC P4350 and 3.5G-device HTC TyTN). HTC Universal will be succeeded by HTC Omni a new type of tablet devices - HTC Athena. Newsworthy drawbacks include only loose back cover and lack of progress regarding the built-in camera’s resolution – other shortcomings can be seamlessly overlooked, as you don’t stumble upon them while squeezing most of the P4350. So on the whole the Herald is a nice-looking offering you shouldn’t pass by.